Last night was a fun night at Pickin' on the Patio even though the weather was soggy. We had fewer participants, which gave those there more opportunities to play. Apparently some people were unaware of the alcove where we can play out of the weather. The evening was cool, and nice and dry under the shelter. Yes, we pick and grin in all kinds of weather. Join us any Monday after Memorial Day and before Labor Day. Pickin' on the Patio is a weekly open-mic jam session hosted by Homer's Coffee House, 80th & Metcalf in Overland Park, Kansas. The group meets every Monday night between Memorial Day and Labor day at 7:30. We began in 2003, so we are into our sixth season. The hostess is Theresa Kaat-Wohlert who does a great job of keeping things moving and assuring that everyone who wants to play has a chance. Her husband Bob, is a musical giant who will gladly give a free music lesson when asked, and helps keep everybody in time and on key. Jim Mathis plays the dobro and was the initiator of this summer event. 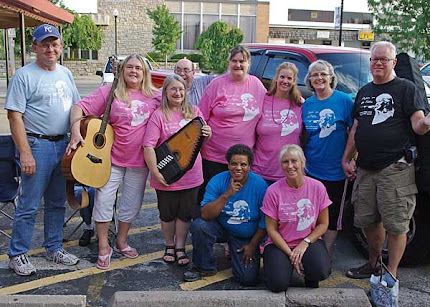 The puprose of Pickin' on the Patio is first, to have a good time; and then to develop friendships and relationships to encourage one another and build one another up. In the process we hope to encourage talent and build musical skills.